Used in (at least) 1985 500SEC Euro Mercedes. 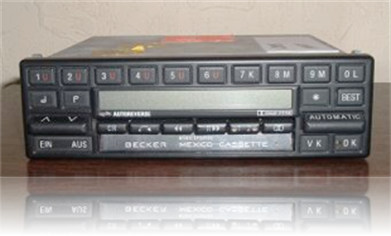 Single-piece unit electronic AM, AM Stereo, and FM radio with automatic seek tuning and cassette player (with CrO2 tape switch and Dolby B Noise Reduction), and with anti-theft. Cassette must be manually inserted and ejected. Two buttons under the Automatic key are labeled VK and DK going from left to right. VK is for tuning in European traffic stations and DK is a mute key. Whereas, the similar North American Model 754 has four AM pre-set keys (7, 8, 9, 0), the 753 has only two AM keys and also a Short-wave and a Long-wave key, (7, labeled "K" for short wave) (8 and 9, labeled "M" which brings in AM) and 0 labeled "L" for long wave. This unit does not have a numerical code. It has a theft deterrent system hooked into the car alarm system. If you have 4 dashes across the display the unit needs to be sent to Becker for repair. See Operation Guide for Model 754.